This girls purple ruffle bedding is so beautiful the way it just flows off the edge of the bed and the through the pillow covers. ​This purple ruffle bedding is only available in twin and full size making it the perfect focal piece for a girls bedroom. It's available in 3 other colors besides purple and includes the comforter and pillow sham to match. This bedding set is available at Wayfair.com and is very affordable, the price is mind-blowing for such exquisite bedding. I love how dramatic and bold this ruched purple comforter brings. Although it's just a solid purple color, it has incredible details that bring it alive. The ruched ruffled texture elegantly flows with the large floral designs. 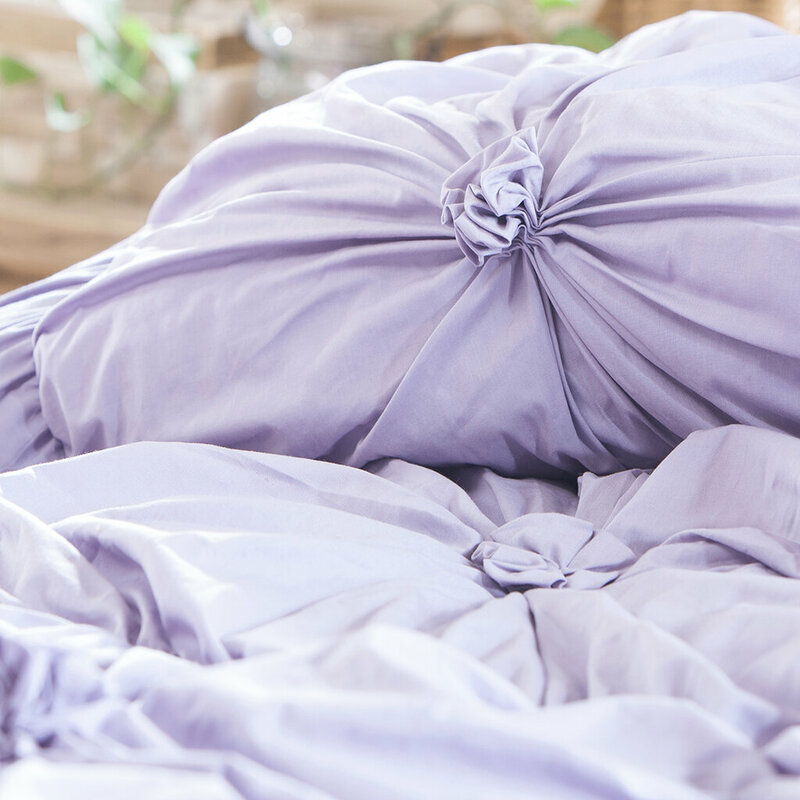 There's really no other bedding set on this site quite as unique as this purple ruffled set. This set is available in purple and silver tone colors and comes in a queen size and king size set. Included with this set is the comforter and matching shams. I love this girlie and frilly light purple and white ruffled polka dot bedding set. The design intermixes two very popular and trendy styles right now - polka dots and ruffles! Purple is always popular with the girls and this comforter set is no exception with it's soft purple and white mix. This purple and white polka dot ruffle bedding is available in a Full / Queen size and comes with the comforter, pillow shams and decorative pillow. I would definitely expand on the look with some white or polka dot sheets to go with this set. I love the look of this sophisticated and stylish solid purple comforter because its anything but plain looking. I personally love working with solid color comforters with textured designs like this because they are so universal. 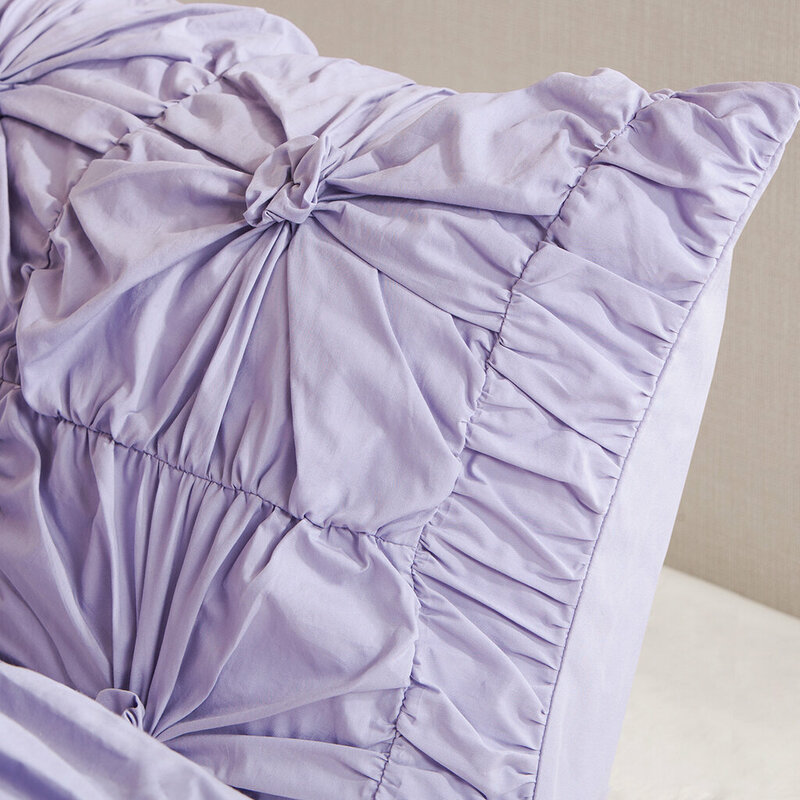 This solid purple comforter features a ruffled design with sleek, straight edges. This ruffled purple comforter is available in Twin and Queen size, it includes the comforter, two pillow shams and one decorative pillow. I love the look of ruffled bedding and this lavender set is just delicious in every way possible. The details in the comforter and pillows are striking! The light color of lavender combined with the ruffles gives a soft, delicate, femininity to the room that can't be overlooked. 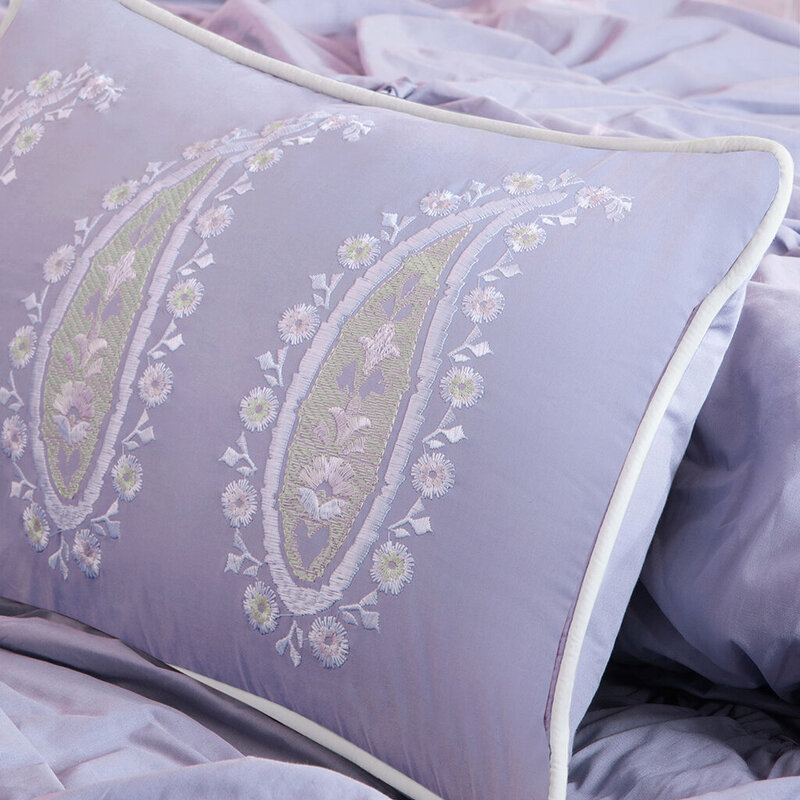 LOOK at the details in the pillows, it's ridiculous how perfect this bedding set is. This set is available in this yummy light purple as well as a charming white. In general, ruffled bedding is desired in lighter colors because the ruffles and detail get lost in darker colors. Ruffles are light, dainty and need a lighter shade of color to show the detail. Notice the Decorative Details in the Pillows! The pillows are what make this bedding set completely irresistible. Notice the embroidered details on the decorative toss pillow and the way the pillow shams compliment the pattern on the comforter. The way the ruffles meet in the center gives this bedding a unique look all it's own. It's truly a show stopper because you can't resist the comfort and charm the ruffles and knots give this bedding ensemble. You won't be able to keep your eyes and body off this comforter set. I love this purple and green floral bedding set because it has that shabby chic, country appeal that looks so cute in a girls bedroom. It's available in two sizes, twin size and full/queen size. I love the soft look of the purple bows against the flowers print. The decorative pillows are available for purchase as well along with the set. This bedding set would look charming with white or natural tone furniture. Maybe a little white wicker and sheer flowing curtains for Spring?